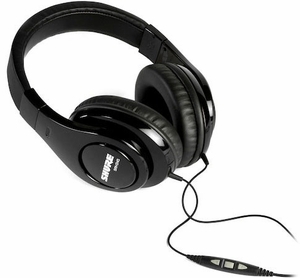 The SRH240m Headphones from Shure provide excellent sound reproduction and feel good around your ears. With 40mm neodymium dynamic drivers optimized for general listening and monitoring, the SRH240 Headphones reproduce deep bass with clear mids and highs. Impedance, power handling and sensitivity are all calibrated for connection to most consumer and pro audio devices. This model upgrades the popular SRH240 with integrated three-button Remote + Mic which allows adjustment of volume, control music and video playback, record voice memos, and answer or end calls on IPhone 3GS, iPhone 4, iPod and iPad.